If, as scholars would have us believe, artists are the canaries in the coal mine of our culture, now comes an exhibit that pegs them as potential seers of the future. The exhibit “Contemporary Magic: A Tarot Deck Art Project,” on display at the Andy Warhol Museum, features the minor and major arcana as reinterpreted by 78 artists, photographers, fashion designers and other creative types, many of whom are known the world over. Organized by curator Stacy Engman of the National Arts Club, the exhibit is a varied display of 78 tarot cards, each created by a different artist in a wide range of media, including photography, painting and collage. The Tarot Card deck first originated in Marseilles, France, in the 1400s. But only in the past century were the cards themselves given pictorial meaning. That changed with what has come to be known as the “Rider-Waite tarot deck,” which was commissioned by occult scholar Edward Waite (1857-1942) about 100 years ago. For this project, each artist was matched with a card based on themes that recur in their work. 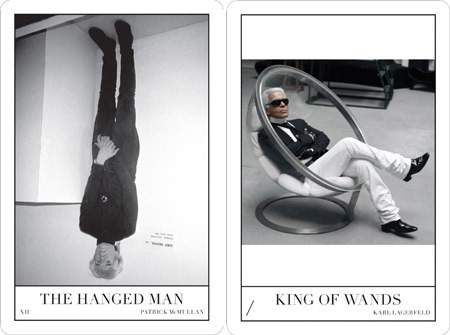 For example, fashion designer Karl Lagerfeld was given the King of Wands, and responded with a picture of himself sitting quite regally in an ultra-modern Lucite chair. Fashion photographer Terry Richardson, assigned the Two of Wands, submitted an image of himself as a modern day hombre, wearing a Black Flag t-shirt, arms crossed, holding rather ominous looking pistols on each hand. With his tattooed forearms and menacing look, the picture easily could be an ad for the jeans he’s wearing or the cover of a men’s magazine. And onetime Carnegie Mellon University art student-turned-art-world superstar John Currin turned in a masterful little figural composition of a laughing, party-going couple, in his inimitable style for the Ten of Cups. Recognizing that with tarot, each combination of cards drawn “is like an art installation in front of you that always changes based on the cards drawn,” Engman began the project three years ago with the idea of combining art and tarot. Every single one of the cards is unique and resonant. Although the exhibit debuted in the fall at the National Arts Club in New York, this second presentation at the Andy Warhol Museum is a little different, having integrated Warhol’s personal tarot cards, and a film he shot in 1966 called “Velvet Underground Tarot Cards,” which never has before been exhibited publicly. It was just refurbished last year. Locals likely will take delight in Yayoi Kusama’s “Queen of Cups,” which features a self-portrait of the reclusive artist who created it. Kusama is the creator of “Infinity Dots Mirrored Room” (1996), the now iconic permanent installation at that museum of the red-dotted mannequins and floor that seem to go on endlessly in a mirrored room. These additions, plus Patrick McMullan’s card “The Hanged Man,” which features an upside down Andy Warhol, make the exhibit all the more relevant for Pittsburghers, not just in terms of contemporary art, but in relationship to Warhol and Pittsburgh as well. Kurt Shaw is the Pittsburgh Tribune-Review art critic. Photo  Patrick McMullan’s “The Hanged Man” (left) and Karl Lagerfeld’s “King of Wands.” Andy Warhol Museum.